Chapter 8: She caught a glimpse of McHugh when she left the dining room. He passed through the hall from the outer door in a gust of frosty air, glowing with vigour and pleasure, and she saw that Trevor had been right. He had already managed to borrow ski trousers and boots from somewhere, and he left dykes of powdery snow outlining his footmarks on the scrubbed boards. The great sweater must have been borrowed too. He was a man who knew how to acquire what he wanted, wherever he might find himself. afternoon sun thinned and grew pale… Frau Agathe was beside him, keeping his speed with ease, checking and turning to correct his errors and guiding with advice and encouragement… In dark-brown ski trousers and a thick corn-yellow sweater, with a woollen cap pulled down over her fair hair, she looked like the most leisured and lovely of the winter tourists who never found their way up here to Obershwandegg. observations: This book has featured before on the blog, and might have been allowed to slip back into obscurity, but this is one of the rare cases where the photos came first: having found Barbie and Ken in ski gear, they couldn’t be wasted. And The Will and the Deed does have a most definite seasonal peg too – the events take place while the cast of characters is trapped in an Alpine village over Christmas time. The author is very firm and clear about this, but then makes almost nothing of it - it’s not really important to the plot at all. The weather and the snow are, but nothing else. As a murder story it has a very competent plot, but gets bogged down with endless discussions of who exactly was where at any given time, plus enough emphasis on who has a motive and who hasn’t to give any experienced detective story reader a big clue. The winter sports atmosphere is interesting and well-done though – in 1960 Peters would be assuming that most of her readers had NOT ever been skiing, but might aspire to, and the book reflects that. 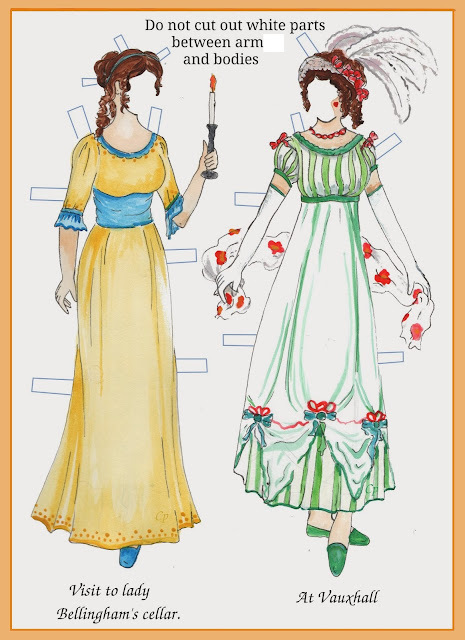 Another attitude of the era is that an offstage character is reported as having hit his wife, but there is something of an implication that she deserved it. Links on the blog: this book previously, and Hotel du Lac in another Swiss hotel. Last year’s Christmas-y Poirot pictured a young woman En Route to the Houseparty of Death. Dead Rich featured a Chanel snowsuit. Killer Barbie appears here. 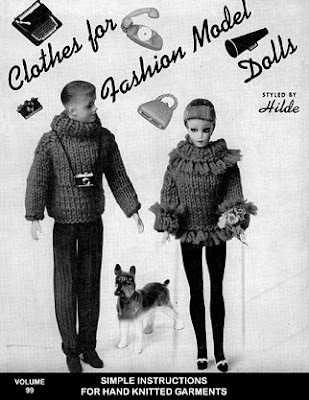 The pictures come from the wonderful free vintage knitting pattern site. Clothes in Books has Guardian form when it comes to Barbies. I can remember girls of my generation such as my wife and sister sewing clothes for Ken and Barbie but not knitting them. Having just read Sycamore Row by John Grisham I think I will wait abit before reading a book involving a will. I enjoyed both the Cadfael books and the T.V. series. I thought of the casting of Cadfael was perfect. Derek Jacobi is a wonderful actor - apparently in anything! I saw him as King Lear a couple of years ago, a very notable performance. I sort of feel I ought to read at least one Peters book, I think I got one at some point earlier this year, but can't remember which one. Definitely wasn't Cadfael. I think her early ones are very much of their time, but interesting for the sociological detail. I'm surprised you haven't asked me yet for those knitting patterns - are your daughters too old for Barbies? The little darlings are 15 and 17.....so the post might be about 10 years too late for me to start knitting! Well you can start knitting with the grandchildren, while reading them Wind in the Willows of course. Interesting choice, Moria, as like a lot of people I'm only familiar with the Cadfael series which I absolutely love. Thanks for this and all the recommendations you've given me over the year. Happy 2014 to you! Same applies Sarah! Happy New Year to you. I had not heard of this book, and missed your first post and the earlier one at Mysteries in Paradise. I am more interested in reading more of the George Felse series, so will skip this one. But nice to know she wrote some standalone books. The fashion dolls in skiing attire are very cute. I have only read the first one in the George Felse series, which started in 1951, so even has mention of aftereffects of WWII. The only thing I am not sure about is that some of the books feature the inspector's son, Dominic, as much as the inspector or more. But I plan to try more and see what I think.